Keira Knightley stars in Festival opener Colette (2018). The British Film Festival is back. Official Naming Partner MINI has come on board this time around, and with 29 features the festival is anything but. 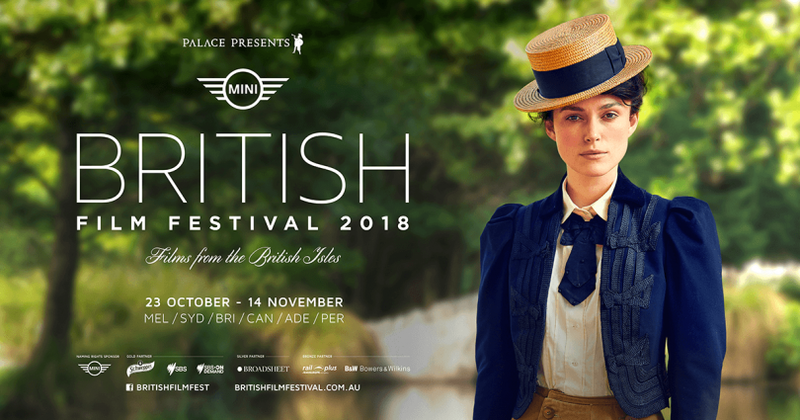 The 2018 festival is replete with 17 Australian Premieres, Special Events, a Michael Caine Tribute, a Swinging 60s retrospective, period pieces aplenty and some family flashback films to boot. Book-ended by two historical works, the festival’s Opening Night screening of Colette (2018) is a trans-channel work of fabled French literary history. Keira Knightley stars as real-life French feminist firebrand and turn of the century author Sidonie-Gabrielle Colette whose debut work was falsely accredited to her husband in this dramatic biopic directed by Wash Westmoreland (Still Alice). This Australian Premiere will be followed by drinks, British fare and live music. Wednesday, 24 October at 6:30 pm. Tickets are $40/$45 for Palace members/non-members. John C. Reilly and Steve Coogan close the Festival in Stan & Ollie (2018). With less of a stroll and more of a tumble, Closing Night again heads down memory lane with biopic Stan & Ollie (2018). Steve Coogan (The Trip, Philomena) and John C. Reilly (Dewey Cox, Step Brothers) star as the dynamic duo in this moving and amusing account of what would prove to be the artistic swan-song of comedy legends Laurel and Hardy. From writer Jeff Pope (Philomena), this Australian Premiere will close the festival on Tuesday, 13 November at 6:30 pm. Enjoy a complimentary glass of wine upon arrival. Tickets are $23/$27 for Palace members/non-members. Thematically aligned with the over-riding retrospective vibe of this year’s festival, there are two special strands included in the 2018 programming. Tipping the hat to one of England’s greatest ever entertainers, there will be a four-feature Michael Caine Tribute celebrating the career of the feted actor who boasts over 120 credits to his name after 60+ years in the business. 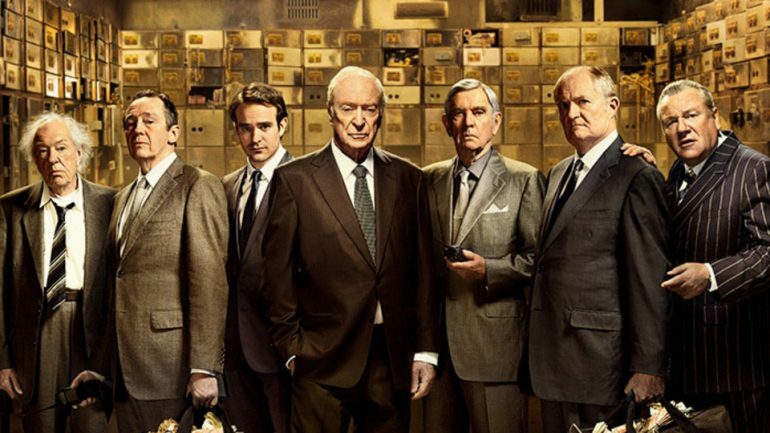 All-star heist drama King of Thieves (2018) starring Michael Caine. Documentary My Generation (2017) takes us on a Caine-curated tour of the era in which he came of age – the Swinging 60s – illuminating the influence the burgeoning pop-culture decade would have on the budding screen icon. One of Caine’s most recent dramatic screen-credits is also included in King of Thieves (2018) from director James Marsh (The Theory of Everything). Both will enjoy their Australian Premieres at the Festival. The festival will also screen classics Alfie (1966) and The Italian Job (1969), casting our gaze back in honour of the enduring English movie maven. To Sir, With Love (1967) – part of the five-film Retrospective: Swinging 60s. Overlapping Michael Caine’s tribute, another 2018 special selection is Retrospective: Swinging 60s which will showcase five features celebrating the mod-booming and tide-turning culture of whimsical, liberal London as British film took a daring leap into the future. Along with Alfie and The Italian Job, the strand will also feature the love-triangle comedy-drama and four-time Oscar-nominated Georgy Girl (1966) which spawned The Seekers’ hit song of the same name; Palme d’Or-winner and frivolous look at libertine London amid the sexual revolution in The Knack… And How To Get It (1965); and the hugely influential high-school drama To Sir, With Love (1967) based on the trying experiences of a black teacher in a rambunctious and predominantly white East End high school in sixties London, starring iconic and then already Oscar-winner Sidney Poitier (In the Heat of the Night, Guess Who’s Coming To Dinner). Flashback Family Films will also feature three classic tales across the festival’s three Canberra weekends respectively with Saturday and Sunday screenings of Paddington (2014), Peter Pan (1953) and Mary Poppins (1964). Screening 10:30 am each morning. All tickets only $8. To mark the 75th anniversary of the namesake military operation, there will also be a Special Restoration screening of one of Britain’s most revered war films – The Dam Busters (1955). Screening 8 Nov, 6:30 pm. Official Selection fleshes out the rest of the program with 16 new films across a variety of themes and genres. For a bit of gauge of what’s on offer, there’s Scottish teen-zombie-musical comedy Anna and the Apocalypse (2017); Hamlet re-imagining Ophelia (2017); heartfelt comedy-drama Sometimes, Always, Never (2017) about a tailor (Bill Nighy) searching for a lost son; amateur, all-male, synchronised swimming comedy Swimming With Men (2018); and high-court judge drama The Children Act (2018) starring Emma Thompson (Love, Actually). The festival’s historical lens is again raised with several features: WWI drama Journey’s End (2017); Mozart biopic Interlude In Prague (2017); Mike Leigh (Mr. Turner) directed account of the 1819 Manchester uprising in Peterloo (2018); documentary Spitfire (2018) about the history-defining fighter aircraft; Oscar Wilde historical drama The Happy Prince (2018); and the dramatic rendering of Virginia Woolf’s literary relationship and clandestine romance with Vita Sackville-West in Vita and Virginia (2018). Idris Elba’s directorial debut Yardie (2018). Keep an eye out for Pin Cushion (2017) – the “emotionally biographical” directorial debut from Deborah Haywood about a co-dependent mother and daughter struggling to be accepted into an unfamiliar and hostile community; Red Joan (2018) – the thrilling true story of spy Joan Stanley and the circumstances surrounding her duplicity and personal sacrifice; and Yardie (2018) – the highly anticipated directorial debut from actor Idris Elba (Luther, The Wire). Adapted from Victor Headley’s 1992 novel, this is a gritty, urban, modern period piece about a brother’s quest for retribution against the backdrop of 70s Kingston, Jamaica and 80s Hackney, London. Pick up the Official Programme at Palace Electric. Visit the Official Website for more information.